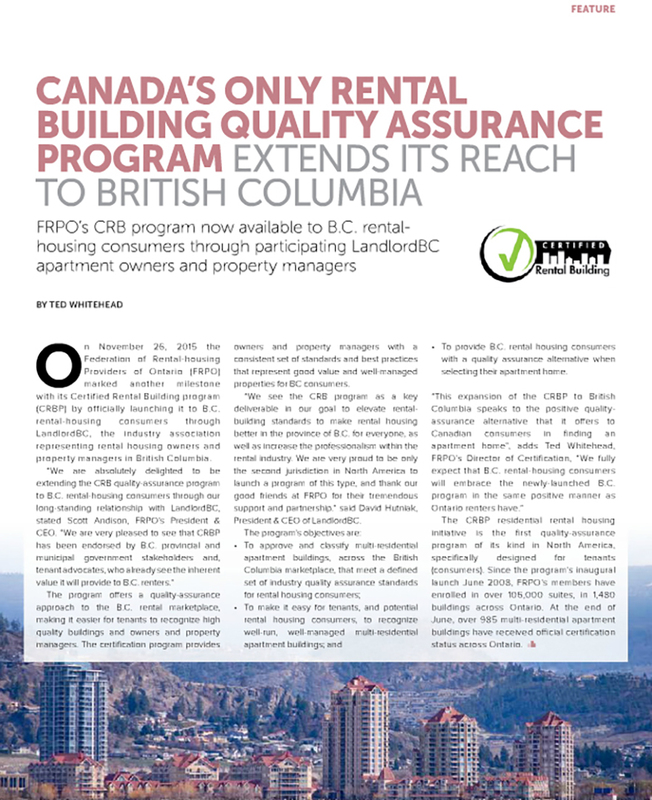 TORONTO – On November 26, 2015, the Federation of Rental-housing Providers of Ontario (FRPO) marked another milestone with its Certified Rental Building program by officially launching it to B.C. through LandlordBC, the industry association representing rental housing owners and property managers in British Columbia. Read the full article in FRPO’s FE Magazine HERE. “With 38 rental communities and 2,500 units certified in Vancouver to date, Hollyburn Properties is proud to represent the largest number of certified rental properties in British Columbia. We are excited to spearhead the CRB program out west with Landlord BC as it allows us to continue to set the bar for best practices in the rental housing industry.” – Allan Wasel, Hollyburn Properties General Manager.